Even though Amazon lists Skottie Young as the author and Jake Parker as the illustrator it is worth noting right off that Skottie Young did most of the art on this as well as wrote it and that is a detail you will find when reading it. The fact that someone can still do the writing and artwork for a comic book in 2016 (Well, this was published as a collection in 2015, but still) just pleases me to no end because it feels like these days everyone needs a team to create a single issue. "A Chasing Tale" collects four issues which are all part of the same story arc and then two which are not. The fifth issue in here is actually the story of treasure and it is told around a campfire by Groot because Rocket doesn't want to tell it again. So it basically a silent issue since the only words you'll find in it are "I", "am" and "Groot". It is a nice issue though even if some people feel like it's not a real story I could just look at these illustrations all day. The first part of this collection involves Rocket looking for the rest of his race and not finding them but instead he does find a large amount of angry ex-girlfriends. 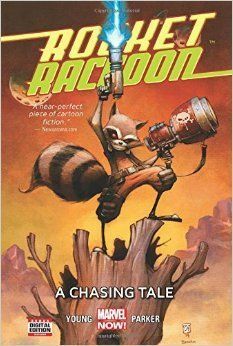 This has action, adventure, comedy and, well, since Rocket Raccoon is in it of course there are also a lot of big guns. Groot is around for most of it as well and the other Guardians make little appearances here and there. I also enjoyed seeing Cosmo in here, though he doesn't come in until the last issue when he asks Rocket for a favor which involves a giant robot. I think one of the things about "Guardians of the Galaxy" that I like most is that it's just such an interesting bunch of characters and together they work as a team-- they compliment each other so well-- but yet I still want to know more about each of them individually. I can compare them with the Avengers and, you know, I like the Avengers and all but I'm not going out of my way to read any origin stories or what not about Hawkeye. That being said, it is hard to decide who my favorite Guardian is because I like each of them for different reasons but I do like Rocket Raccoon perhaps the most. If you don't think Rocket Raccoon can exist without the other Guardians of the Galaxy then you have something to learn from this comic book. Even if I had never heard of Rocket Raccoon before- never known him from GotG- having read this I would still be a fan of his because he just is the action hero that everyone else should be. And yeah, he even takes a (verbal) shot at Deadpool at one point and so having this in the Marvel Universe is cool too, but having Rocket on his own, in a pulp setting could be just as nice. Though that also makes me think of Howard the Duck and then I wonder if maybe I just like Rocket most because of his connection to Howard, but nah, Rocket brings out the big guns and the one-liners and so you should be reading this over and over.